The Qing Dynasty continued to rule strongly until near the end of the 1700s AD. In 1735, the Yongsheng Emperor died and his son, the 24-year-old Qianlong Emperor, took power. Like his father and grandfather, the Qianlong Emperor kept power in his own hands. 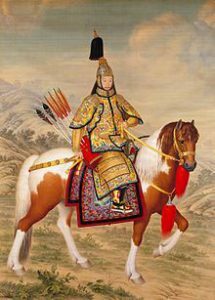 The Qianlong Emperor took advantage of the weakness of Central Asian kingdoms and the collapse of the Safavids in West Asia to send his army further west and conquer a lot of Central Asia, including the Uighurs in 1759 AD. Under the Qianlong emperor, China also started exporting porcelain to Europe again. The Qianlong Emperor also got more control over Tibet and Nepal, to the south. But when he tried to conquer further south into Burma, Thailand, and Vietnam, his army lost. When the Qianlong Emperor got to be an old man, he wasn’t able to lead his army into battle anymore. And he didn’t really control China anymore. He left most of the work to his minister He Shen. The army generals paid less attention to him, and the Chinese army got weaker, especially in southern China, far away from the emperor in Beijing. Local warlords in southern China started to operate on their own account. They stopped paying their taxes. They didn’t obey the law. The Qianlong Emperor wasn’t powerful enough for them to care about anymore. As Qianlong’s army got weaker, Chinese traders were selling more and more tea, porcelain, and silk to Britain every year. British people loved these things. They were willing to pay a lot of money for them. But Britain needed something to trade to people in China in exchange, and they weren’t having any luck with that. What could Britain sell to China? China didn’t really want anything Britain was selling. Wool cloth? Nope. Gin and whiskey? No, thanks. Enslaved African people? No. Glass beads? I don’t think so. British traders got an idea. 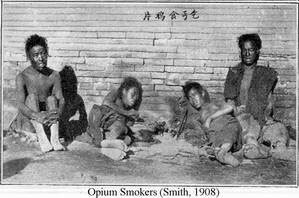 They started to sell opium from India to people in China. Opium is an addictive drug, so once you got people addicted they would buy more and more opium. That worked great for Britain, but the government of China didn’t like everyone being on drugs! By this time, Britain had gotten control of India, but they had lost control of the United States. To make up for that, British generals were looking for a way to get control of China now. They could not convince China to allow British traders to come and go the way they had in India. The Qianlong Emperor saw what had happened to India. He didn’t want British generals to rule China! So the British generals kept on smuggling more and more illegal opium into China and getting more and more people addicted to opium. There were people just lying in the streets, strung out on junk, all over the place, especially in Southern China. In 1796, when he was 85 years old, the Qianlong Emperor retired and left the throne to his son, the Jiaqing Emperor. Still the Qianlong Emperor kept the real power until he died three years later. 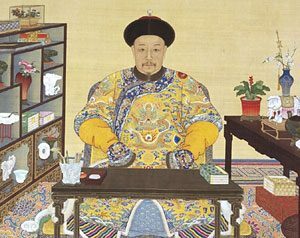 After the Qianlong Emperor died, Jiaqing worked to get power back into his own hands. He forced his father’s minister He Shen to kill himself. But by 1800 Europeans were becoming more and more of a problem for China. Cite this page: Carr, K.E. Qianlong Emperor – Qing Dynasty China. Quatr.us Study Guides, June 4, 2017. Web. April 17, 2019.